Should I Do a Personal Guarantee for My Retail Store? Should You Do a Personal Guarantee for Your Retail Store? You need credit or a new vendor account for your retail store and all you have to do is sign your name to the bottom line. Doesn't seem like that big of a deal, after all, isn't this the type of risk an entrepreneur takes? Retail is a risky investment for banks and lenders. 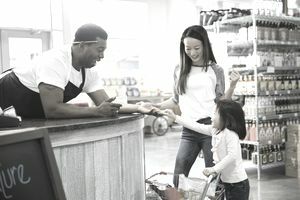 Even the Small Business Association (SBA) now requires that all loans provided through the SBA must be personally guaranteed by anyone with 20% or more ownership in the store. When you sign a personal guarantee on a note for your retail store, it is an unsecured debt. In other words, you are not listing your house as collateral. If the debt is not paid, you are personally liable to pay it — meaning that creditors can come after you personally which may cost you your house or car if you have to sell them to satisfy the debt. Sure, once a business gets large enough, they will accept financial statements in lieu of the guarantee, but that is a very large business, not the typical retail owner. Before you sign that dotted line, you should consult an advisor or partner. When you are the owner, it's easy to have a distorted faith in your store. After all, a $500 line of credit with a vendor is no big deal, you may think. One account gone wrong can put them all at risk. Many vendors use a "factor" to collect their debts. This is an outsourced accounting function that has an odd side effect — the same factor works for several different vendors. Approach the decision to sign a personal guarantee the same as all of your business decisions. Cash is king in retail. When you hit that slump in sales you have a safety net. Many small business owners choose to use their personal savings rather than the guarantee, which has its merits. Remember, the solvency of your dream is based on you having cash available to pay for it. There are lots of ways to finance your retail business, but all of them will include some risk on your part. For example, if you use your 401k to start, that puts your retirement at risk. If you borrow from a family member, that puts your relationship at risk. The main risk is your personal credit or net worth if you have to make good on the debt. Another risk may be to your spouse. Most banks will require a spouse to sign as well if the loan amount is above a certain limit. Compared to other forms of financing that may include interest payments, a personal guarantee seems less costly, but that is not always the case. Be objective when making a decision. Keep track of where you have placed your "mark" as a personal guarantee. Many retailers have no clue how many times they have signed the guarantee and thus have no idea of the risk of their dream.